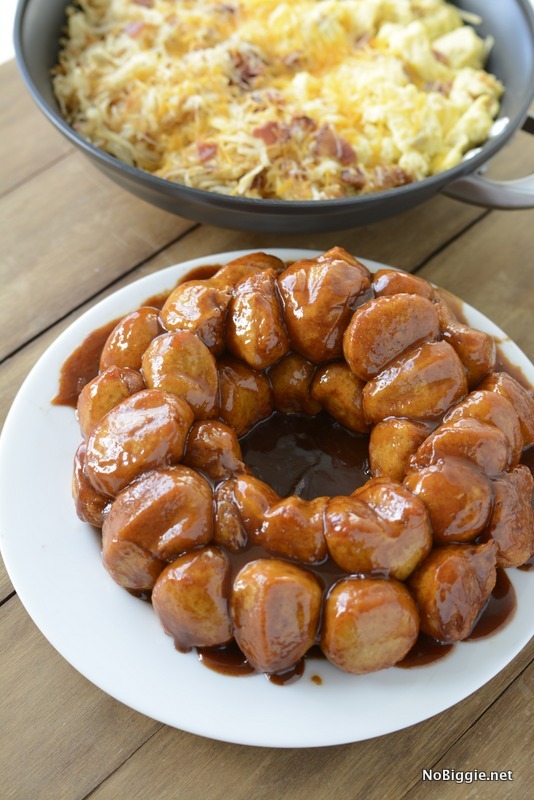 Sticky Ring and Hash…aka Monkey Bread…aka sticky buns with hashbrowns is our favorite special occasion breakfast. 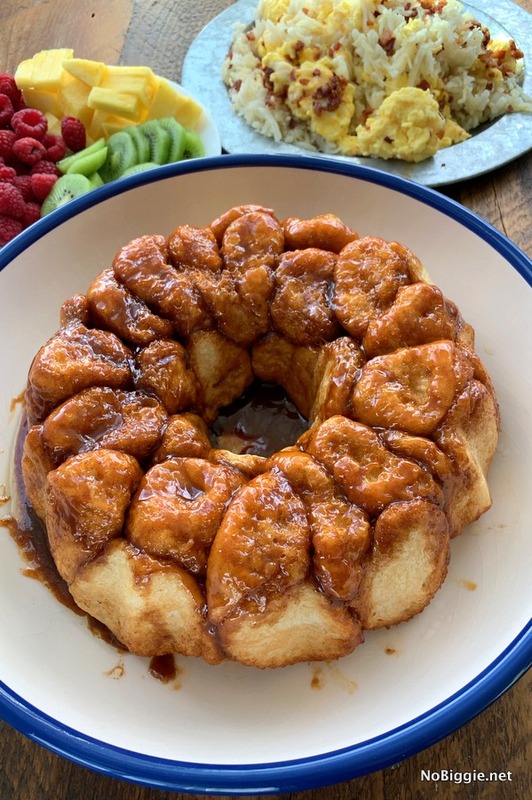 You might know today’s recipe as monkey bread, but ever since I married my husband, I’ve only known it as “sticky ring”! 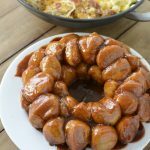 You know the delicious sticky buns baked in a ring (bundt pan)…I’m pretty sure that’s how the name sticky ring came about. My sweet Mother-in-law always makes two of them when she makes it…one with pecans and one without. It’s such a fun breakfast to feed a crowd. The hash is a mixture of hash browns with scrambled eggs and bacon. We always serve fresh fruit with it too. 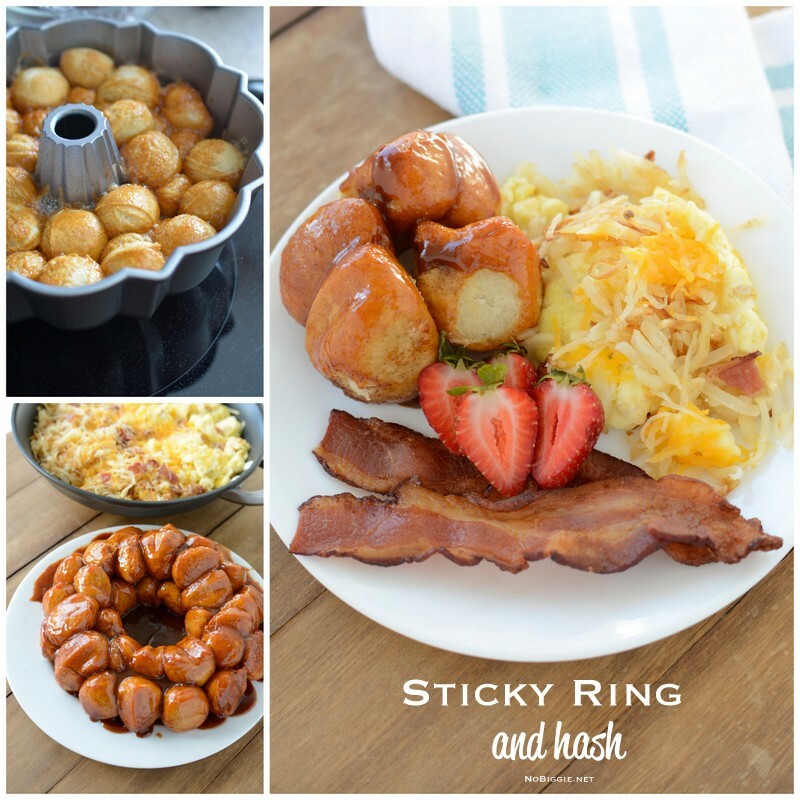 Sticky ring and hash is our LDS Conference breakfast tradition. I don’t talk often about my faith here on the blog, but I am a member of The Church of Jesus Christ of Latter Day Saints (aka The Mormon Faith) and my faith has been such a source of peace and happiness in my life. 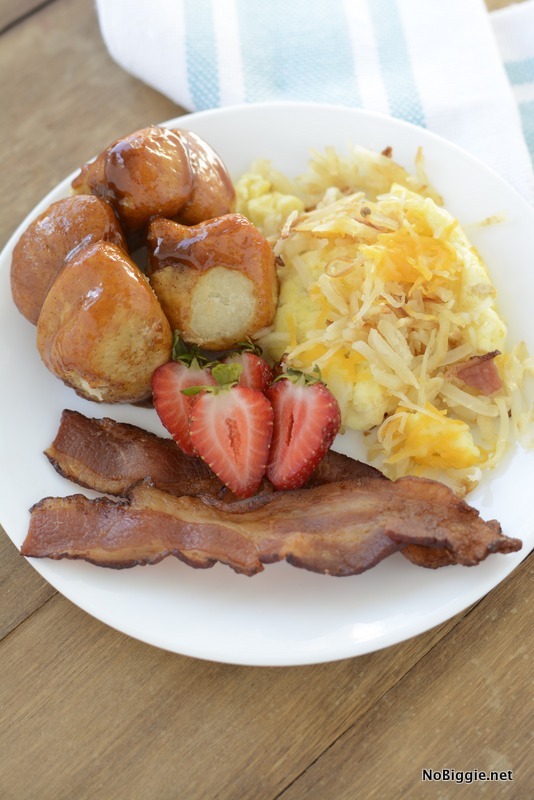 This big breakfast is our favorite special occasion breakfast, especially on LDS General Conference Weekend, and for birthdays and holidays like Christmas morning too. Our General Conference happens twice a year (the first weekend in April and the first weekend in October) and we all look forward to it. It’s our opportunity to listen to messages from our modern day prophet and church leaders. I always come away inspired and uplifted. If you’ve ever wondered about the LDS faith, I invite you to watch the live broadcast online. You can watch or listen to it online on LDS.org. There are 4 different sessions, two on Saturday and two on Sunday each two hours long. The best part is that you can listen from home in the comfort of your soft pants, and you don’t have to be wearing your Sunday Best! Okay…on with this delicious recipe. Here’s the ingredient lineup. Please note the Butterscotch pudding mix in this recipe is: Cook and Serve…not instant. I once bought the instant jello and the sauce did not turn out right. 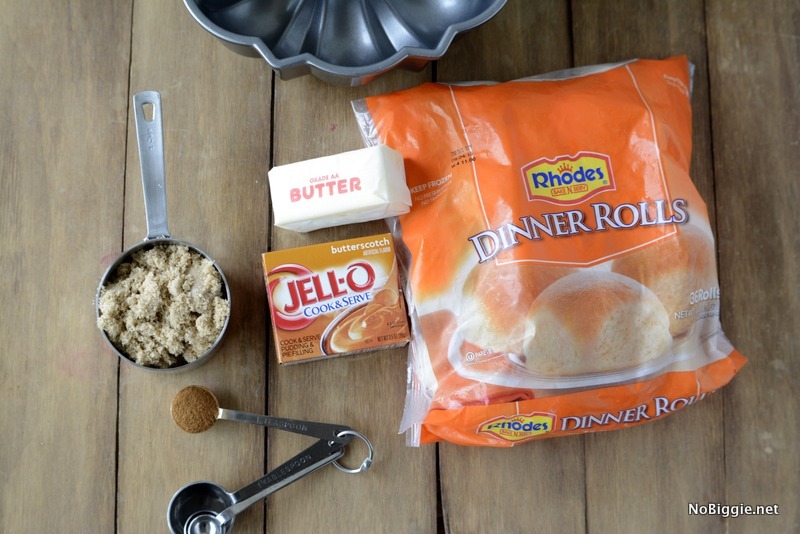 Do you have access to these Rhodes dinner rolls in the freezer section of your grocery store? They really make this recipe come together so easily, plus they are delicious! If not, use what you can find. 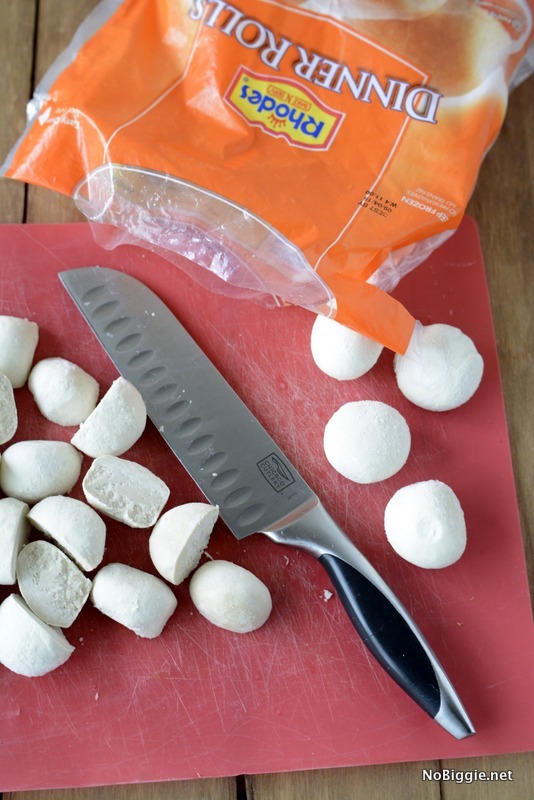 You’ll cut each dinner roll in half. To start: make sure to spray your bundt pan with non stick cooking spray. You’ll put the frozen roll halves into the pan and you’ll pour the sauce mixture over the rolls. This will go into your refrigerator over night. Be sure to cover the top with plastic wrap. Once it is done baking, take it out of the oven. Right out of the oven, you will want to flip it over upside down immediately onto your serving plate leaving the pan over the top. Let gravity pull the delicious sauce and sticky buns down onto the plate. Leave the pan over the top of it until you are ready to serve. The bundt pan will help keep it warm. I once let it set in the pan right side up, and the sauce set in the pan and it was super hard to get it out of the pan. The excess sauce might drip over the plate. It’s a good idea to put tinfoil or a paper towel underneath the serving plate for easy cleanup. The trick is to get it all ready at the same time. You can make the hash (the hash browns, scrambled eggs and crispy bacon) the night before and warm it up in the morning. 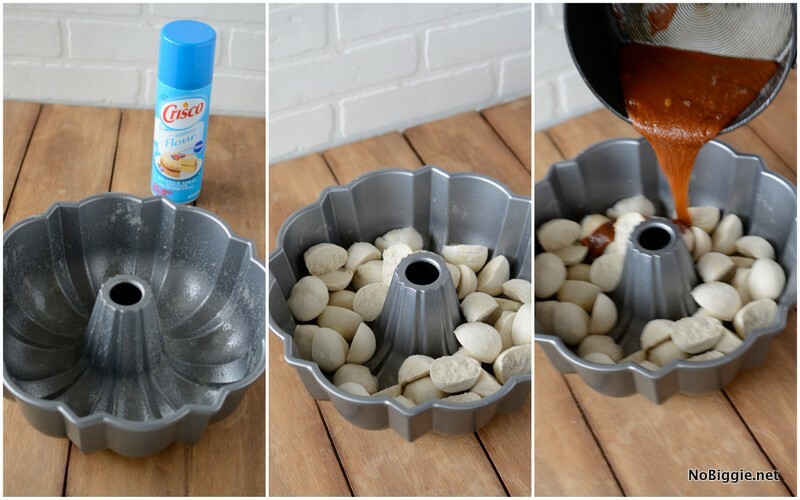 Spray your bundt pan with non stick cooking spray. Cut all the rolls in half. *If adding pecans...sprinkle the pecans into the bottom of the pan. Drop the rolls into the bottom of the pan. In a sauce pan at medium heat, melt the butter. Add the pudding mix, brown sugar and cinnamon and stir until it is a smooth caramel type sauce. Pour this hot mixture over the rolls making sure to cover all the tops. Be sure to use up all the sauce, it's the best part! Before baking, remove plastic wrap and let it sit at room temp for 30-40 minutes. Put in cold oven and set temp to 350. Bake for 35 minutes, but watch the top and cover with foil if it gets too brown. Take out of oven and immediately invert onto a large serving plate. Serve warm. If you have a hard time finding Butterscotch Cook and Serve Jello in the store, I have had success with this recipe using Vanilla Cook and Serve Jello with a tablespoon of molasses and a tablespoon of butterscotch dessert topping…and guess what?…it worked!! It tastes delicious! I hope you enjoy it! 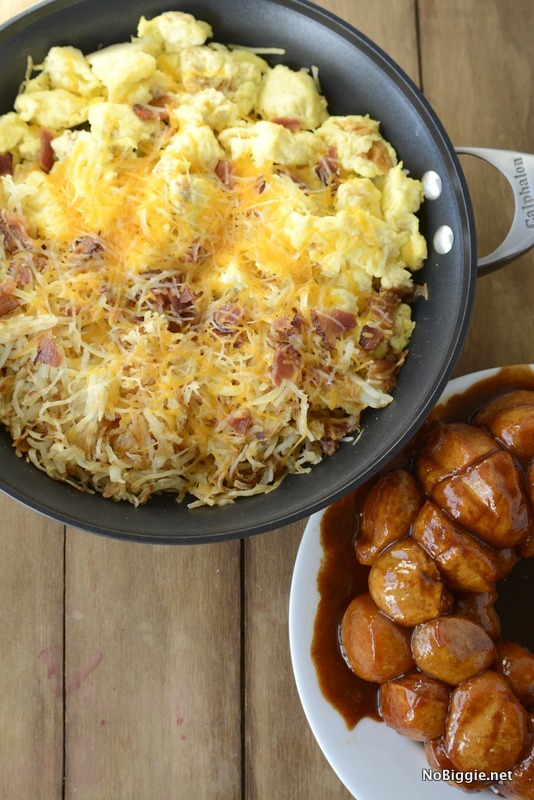 It’s a special occasion weekend breakfast for sure, one of our favorites! 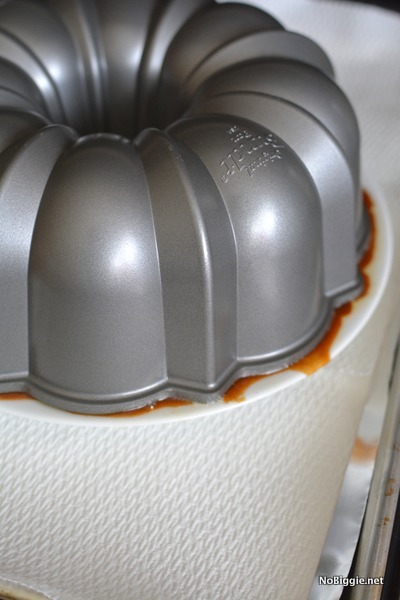 Quick Note: when baking, I always bake with a sheet pan underneath the bundt pan in the oven, because I once had a little oven fire when the sticky sauce over flowed out of the bundt pan onto the bottom of the oven. So…a sheet pan lined with foil is so helpful.